Jobs in Property launch their new jobsboard dedicated to the estate and letting agency industry. Recruitive have built for them a jobsboard website that is GDPR compliant, fast, efficient, fully responsive and attractive. 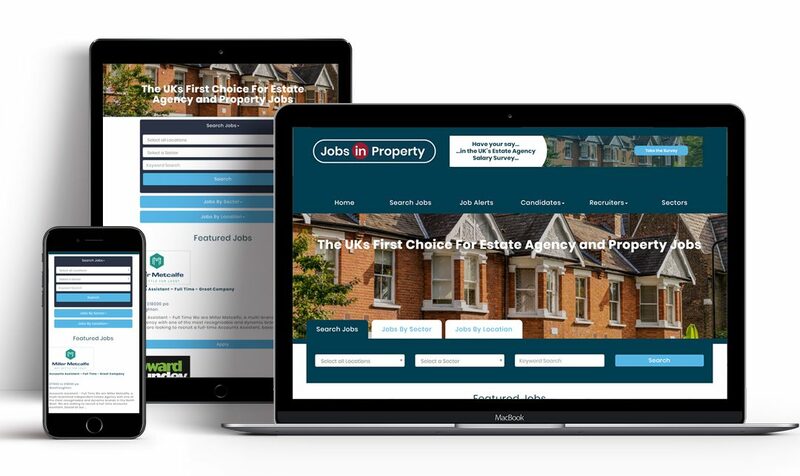 This new jobsboard is called jobsinproperty.co.uk and it is already creating quite a stir among estate agents and property rental agents up and down the UK, as client and candidate interest has been noticeably significant within the first few days of its existence. Wouldn’t you like a career where every day is different, is not just the same 9-5 office environment and rewards those who make the effort to go the extra mile? Jobs in Property offers exciting permanent and temporary, full and part time opportunities for estate and letting agents across the UK. A career as an estate agent or a letting agent isn’t just another job in an office; it’s a day-to-day challenge in an exciting, ever-moving industry. Submit your CV to the growing database or search for jobs on offer from high street chains or boutique estate agencies and letting agencies. Trainees, graduates and more experienced individuals with an extensive background working in the property sales or lettings sector can find a job in the local area to suit their talents and experience level. Are you on the lookout for new talented property professionals? Clients advertise your vacancies safe in the knowledge that this website is the place where all of the industry’s top talent are going to be looking for their next career opportunity. Alternatively, clients can search in the large and growing database to find exactly who they are looking for to join their existing team; people with the experience, skills and qualifications to make a real difference to their business. If you are looking for the highest calibre individuals to compliment your team then advertise your opportunities on Jobs in Property. Jobs in Property is The UKs First Choice For Estate Agency and Property Jobs; it is the site everyone is talking about and turning to for their recruitment needs. Whether you are a jobseeker looking for your next job in estate agency, or an established agency looking for your next recruit, jobsinproperty.co.uk is the jobsboard for you. Contact them today!